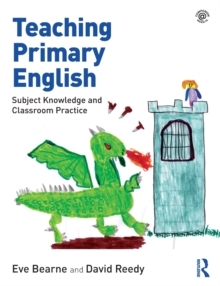 Teaching Primary English is a comprehensive, evidence-informed introduction designed to support and inspire teaching and learning in the primary school. Written in a clear and accessible way, it draws on the very latest research and theory to describe and exemplify a full and rich English curriculum. It offers those on teacher training courses, as well as qualified teachers who are looking to develop their practice, subject knowledge and guidance for effective, enjoyable classroom practice. Advice and ideas are supported by explicit examples of good teaching linked to video clips filmed in real schools, reflective activities, observational tasks and online resources. Each chapter includes suggestions for great children's literature, considers assessment throughout and offers support planning for diversity and special educational needs. Key topics covered include:spoken language for teaching and learningstorytelling, drama and role playreading for pleasureearly reading, including phonicspoetrywriting compositionspelling and handwriting grammar and punctuationresponding to and assessing writing multimodal, multimedia and digital texts. With a focus on connecting all modes of English, the global and the local, and home and school experience, this detailed, uplifting book will support you in developing a curious, critical approach to teaching and learning English. Additional content can be found on the fantastic supporting website. Features include:video clips from within the classroom to demonstrate English teaching techniquesaudio resources, including an interactive quiz, to check understanding and provide real-life examples and case studiesdownloadable resources to support teaching and incorporate into lesson plans.